Colonial era nautical chart of New York City and Harbor. A Draught of New York from the Hook to New York Town. A scarce and impressive colonial period c. 1773 Mark Tiddeman nautical chart of New York City and harbor. Oriented to the west and centered on Coney Island (Cunny I. 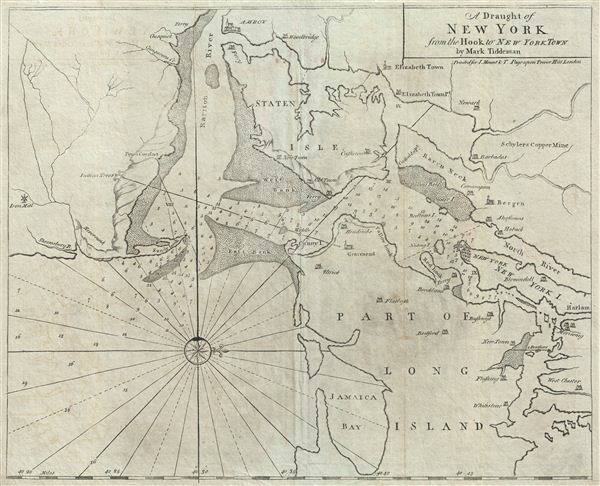 ), Tiddeman's chart coves from Staten Island to Jamaica Bay and from Sandy Hook to Harlem (northern Manhattan). There is a compass rose in the lower left quadrant. Relief, towns, and mills are represented pictorially. Numerous depth soundings fill the harbor and sand banks are rendered with stippling. Some twenty-seven cities and villages are identified, often with quaint spellings of still common place names: Brockland (Brooklyn), Hobuck (Hoboken), Blomindoll (Bloomingdale), West Chester (Westchester), and Bushwyk (Bushwick), to name few. The map also identifies various mines and mills, including Schyler's Copper Mine in modern day North Arlington New Jersey, and an Iron Mill south of Sandy Hook. This unusual chart was first issued in the 1732 edition of the english Pilot, the present example being the third state, marked by additional stippling, hachuring, and minor adjustments to the imprint. The map's parent publication, book four of the english Pilot, was one of the most influential collections of nautical charts ever published. Form the first printing in 1732, the english Pilot appeared in some 37 editions over the next century, remaining popular even after much of its contents became outdated and better charts, such as those contained within Sayer and Bennett's North American Pilot and Des Barres' Atlantic Neptune became available. This chart is impressive for its inaccuracy and rather vague rendering of the region, which its itself indicative of the relatively limited hydrographic knowledge of the region in the early and middle parts of the 18th century. Augustyn and Cohen, in Manhattan in Maps, note that Tiddeman's map was better than most of its contemporaries, however, ' makes the entrance to the Lower Bay of New York Harbor appear to be less of a challenge than it really is.' The entrance to New York Harbor was, in fact, quite challenging due to the narrow entrance between Sandy Hook and east Bank followed a the critical sharp turn to starboard required to alight in New York. Until truly accurate nautical charts appeared in the early days of the U.S. Coast Survey and the entrance was widened in the 1890s, shipwrecks in this area were common - it is not inconceivable that this popular chart may have been partially responsible for at least some of them. Published by Mount and Page of Tower Hill, London, for the c. 1773 issue of the english Pilot, book four. The English Pilot. Fourth Book, (London) c. 1773. Very good. Even overall toning. Original centerfold exhibits slight wear. Some edge wear to outer margins. Blank on verso. Augustyn, R. and Cohen, P., Manhattan in Maps, pp. 66-67. Haskell, D., Manhattan Maps: A Co-operative List, #254-256. Sellers, John R. and Van Ee, Patricia, Maps and Charts of North America, #1220. Verner, C., A Carto-Bibliographical Study of The English Pilot The Fourth Book, pp.65-68. Philipps (Atlases), 1162. New York Public Library, Map Division, Map Div. 89-5007. Meinig, D. W., The Shaping of America, A Geographical Perspective on 500 Years of Histroy, pl. 23, page 120.